What Type of Habitat Do Crabs Live In? When you think of a crab, you probably picture a bright red ocean creature with large front claws and legs that stick out to either side of its body. But this common image doesn't accurately represent all crabs. These amazing animals come in all sizes and have adapted to live in all sorts of environments, both in and out of the earth's oceans. 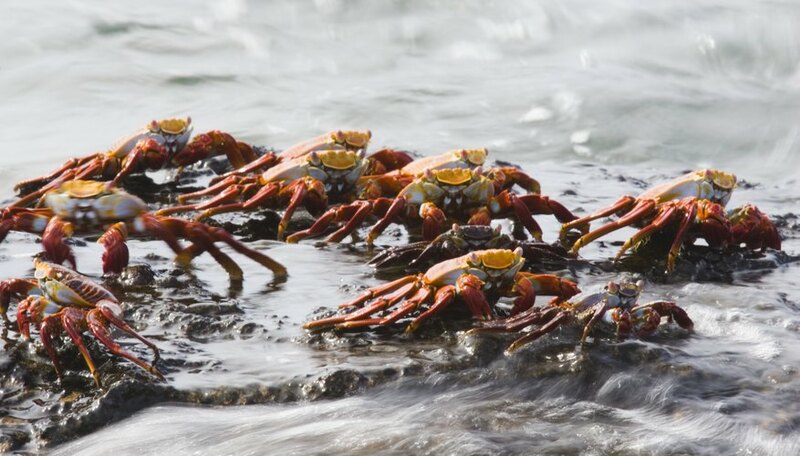 Some crabs roam the ocean floor in large groups. Others live solitary lives, hiding in the discarded shells of other animals. Some crabs even live on land. Where and how a crab lives depends on its species. 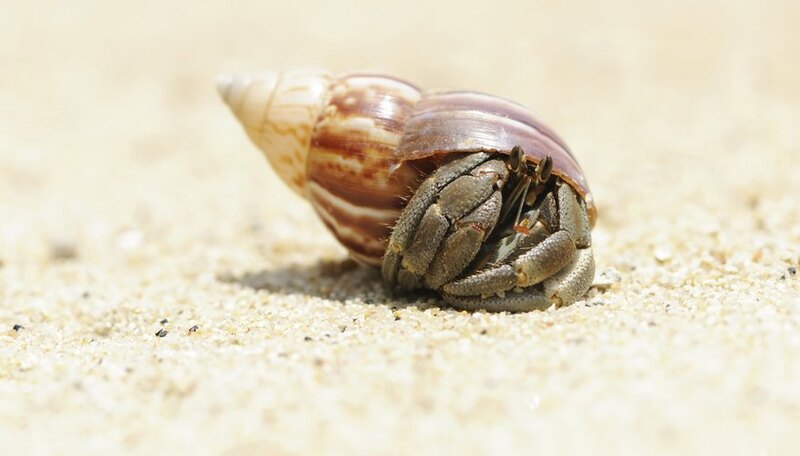 Hermit crabs live in the ocean or on sandy beaches, where they burrow into the sand. 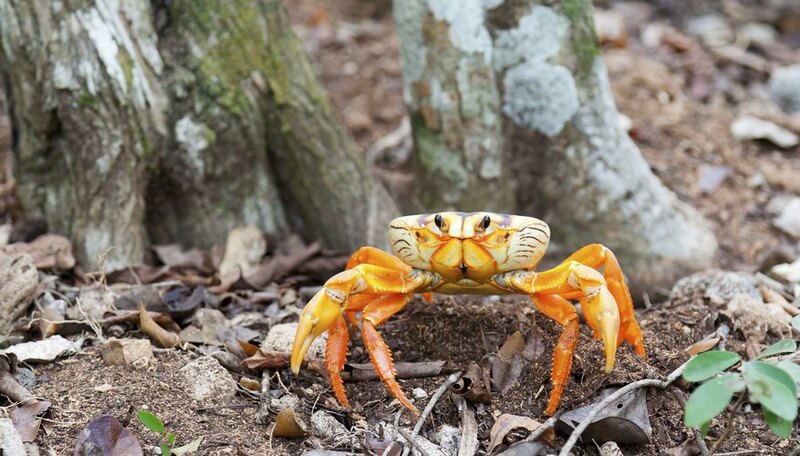 Yellow land crabs live in forests from Cuba to Barbados, sometimes miles from the ocean and can even climb trees to find food. Sally lightfoot crabs live on the rocky shores of the Americas, where they hide between rocks until hunting time comes at low tide. Some hermit crabs must stay in the water at all times, but most species live on moist, sandy beaches, even though they need water to breath. A hermit crab's gills can continue to supply a hermit crab with oxygen, even out of the water, as long as they stay moist. The wet ocean air on most beaches is enough to keep these crabs breathing easy. In captivity, hermit crab enclosures require repeated hose sprays to stay moist. Commonly found in pet stores around the world, hermit crabs consist of about 1,000 species, all of which share one trait: they use the shells of other animals to protect themselves. Hermit crabs usually live in or near sea water and use discarded mollusk or sea-snail shells to protect their soft, distinctively shaped spiral abdomens. The abdomen's shape helps hermit crabs grip onto smooth shells from the inside. When a hermit crab's shell becomes too snug, they go in search of a new, larger shell. Competition for shells is fierce on beaches where many hermit crabs live, especially since hermit crabs often dig their burrows in close proximity to one another. Yellow land crabs, also known as purple land crabs, red land crabs and black land crabs, come in a plethora of colors, even though they are all the same species, Gecarcinus Ruricola. These bright or dark crabs live in a large portion of the Caribbean, from western Cuba to eastern Barbados. Unlike most crabs, yellow land crabs are can live their entire adult lives on land, far from the sea. These crabs begin their lives in the ocean, as the females travel in huge groups to the sea to deposit fertilized eggs. The baby crabs live in the water before migrating in massive groups away from the sea and onto land. These migrations, which involve hundreds of thousands of crabs, often draw scientists, photographers and tourists. Yellow land crabs cat eat a wide variety of foods, from fruits and vegetables to insects and mice. The crabs usually dig burrows in moist patches of dirt and spend most of the day in hiding. At night, the crabs wake up and roam around as they hunt for food. Just like hermit crabs, a yellow land crab's gills require moisture to breath, but their efficient gills pull moisture more effectively from the air than their cousins, which allows them to live farther away from shore than hermit crabs do. Yellow land crabs are often found miles from the ocean, sometimes at high altitudes. These crabs also climb steep hills and even trees in search of food. Sally lightfoot crabs, also known as red rock crabs, live along the coasts of the Americas. Their name comes from the way they walk: fast, on the tips of their legs. While their appearance is similar to that of the yellow land crab, even sharing bright coloration, their habitat is more similar to that of the hermit crab, since sally lightfoots live near the ocean. But that's where similarities end. While hermit crabs live in sandy burrows, sally lightfoots live on rocky shores, where sea spray from crashing waves helps to keep their gills moist. These crabs spend most of the day hiding in rocky crevices, but usually become active at low tide. During times of activity, they crawl over rocks and scrape off algae to eat. Sally lightfoots also eat other animals if the opportunity arises, from baby sea turtles to smaller crabs. From sandy beaches, to forests and rocky shores, crabs live in diverse environments, as long as the air is moist enough to allow them to breath. Where and how a crab lives depends entirely on its species. Where Do Turtles Live & Lay Their Eggs? How Do Penguins Protect Themselves from Enemies? Cook, Maria. "What Type of Habitat Do Crabs Live In?" Sciencing, https://sciencing.com/type-do-crabs-live-in-6374913.html. 11 April 2018.